These words were spoken by Dr. Martin Luther King, Jr. in a speech to the Medical Community of Human Rights in Chicago a half century ago. 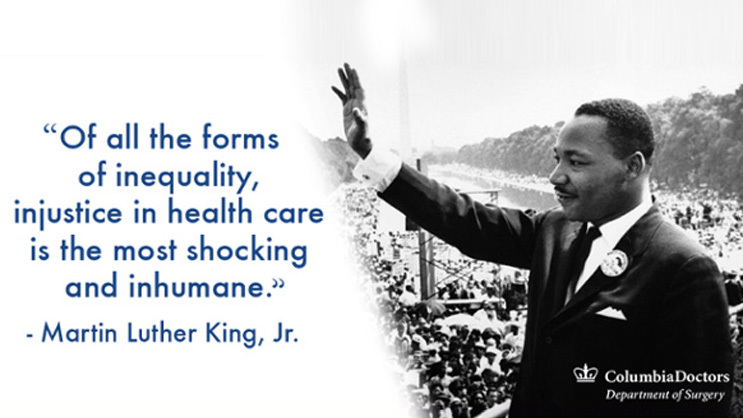 Even then, while Dr. King risked his life to secure basic civil rights in this nation, he understood that achieving racial equality would be impossible without parity in health care. Sadly, despite the technological marvels and all manners of material excesses we have created, his words still describe much of the experiences of minorities in New York City and across the country. This trend can be seen clearly in cancer, where incidence and survival rates vary considerably across racial and ethnic groups. In collaboration with the Herbert Irving Comprehensive Care Center (HICCC), the Department of Surgery at NewYork-Presbyterian/Columbia is working to turn that trend around with programs designed to increase the participation of minorities in cancer research and to ensure access to both our preventive and treatment services. The Minority Underserved Community Oncology Research Program (MU-NCORP) at HICCC is one of only 12 programs in the country dedicated to ensuring full representation of minorities in clinical trials. Expanding upon a similar program that immediately preceded it, NCORP currently recruits minorities to participate in over 40 of the most significant cancer trials including the PACES trial for colon cancer, ALLIANCE trial for breast cancer, and ALCHEMIST trial for lung cancer. In addition to ensuring that researchers fully study the way treatments and technologies work for minority populations, the program expands the quality and improves access to the most advanced cancer therapies to thousands of patients who otherwise might not receive such care. Read more about the NCORP initiative. Individual divisions within the Department of Surgery are also tackling racial and ethnic disparities in specific clinical areas through outreach efforts, screening programs, and research. Breast cancer: Disparities in breast cancer are nothing short of stark. Even though white women are more likely than black women to develop breast cancer, black women in the U.S. are 40% more likely to die of breast cancer than white women. Hispanic and Asian women face different but significant disparities as well. Asian women have higher rates of mastectomy and lower rates of breast reconstruction than their non-Asian peers. Hispanic and black women are more likely to receive diagnosis at later stages, which leads to poorer outcomes. A monthly Wellness Series is also held locally in Spanish as well as English, which provides cancer prevention and wellness education and support to women who have been diagnosed with any form of cancer, and is specifically designed to reach minority women in the Washington Heights area. Our physician-researchers are focused on understanding and rectifying ethnic disparities in care for women with breast cancer through many studies, including a current study on breast reconstruction after mastectomy among Chinese women, a study of an intervention to prevent lymphedema in Chinese patients, and many other trials. The Mailman School of Public Health just concluded a study called Cook for Your Life, which focused on improving nutrition among Hispanic breast cancer patients, which is part of larger efforts to improve cancer outcomes in Latina patients through lifestyle changes such as a healthy diet. The Breast Cancer Program has also established translation services for Spanish and Chinese speaking patients to facilitate patient registration as well as appointments with physicians and other staff. Gastric (stomach) cancer: Gastric cancer is one of the most common cancers in Asia. In the U.S., it disproportionately affects Asian American, black, and Hispanic patients. The Gastric Cancer Care Program of NewYork-Presbyterian/Columbia University Medical Center is committed to reducing the toll of gastric cancer overall, particularly through intensive efforts to promote early screening for high-risk patients. In addition to efforts aimed at establishing new national standards for screening, the center has enrolled 100 Korean American patients for gastric cancer screening in a prevention and early detection study in partnership with Holy Name Hospital's Korean Medical Program in New Jersey. In a complementary manner, two NYP programs ensure quality and access to cancer care. The Community and Ambulatory Research and Education (CARE) Program assures diverse representation in cancer research, and the Manhattan Cancer Services Program (MCSP) is on ongoing cancer screening and education program for uninsured New Yorkers. Diagnostic and treatment services are provided by NYP providers at seven locations in Manhattan for patients' convenience. MCSP also conducts Patient Navigation services through The Ambulatory Care Clinics at NewYork Presbyterian to assure participation in cancer screening by all enrolled patients. We believe every person deserves high quality health care. Despite much progress during the past decades, much work clearly remains to be done. We hope our contributions will have lasting impact that ripples from our center, to our city, our nation, and beyond. Cancer statistics, 2013. Siegel R, Naishadham D, Jemal A CA Cancer J Clin. 2013 Jan; 63(1):11-30.
Review: Understanding racial disparities in cancer treatment and outcomes. Morris AM, Rhoads KF, Stain SC, Birkmeyer JD J Am Coll Surg. 2010 Jul; 211(1):105-13. Identifying risk factors for disparities in breast cancer mortality among African-American and Hispanic women. Tian N et al. Womens Health Issues. 2012 May-Jun;22(3):e267-76. doi: 10.1016/j.whi.2011.11.007. Epub 2012 Jan 21.